The Houston Chronicle reports that the federal government is investigating 6 incidents of Houston Police shooting or otherwise allegedly abusing unarmed persons. 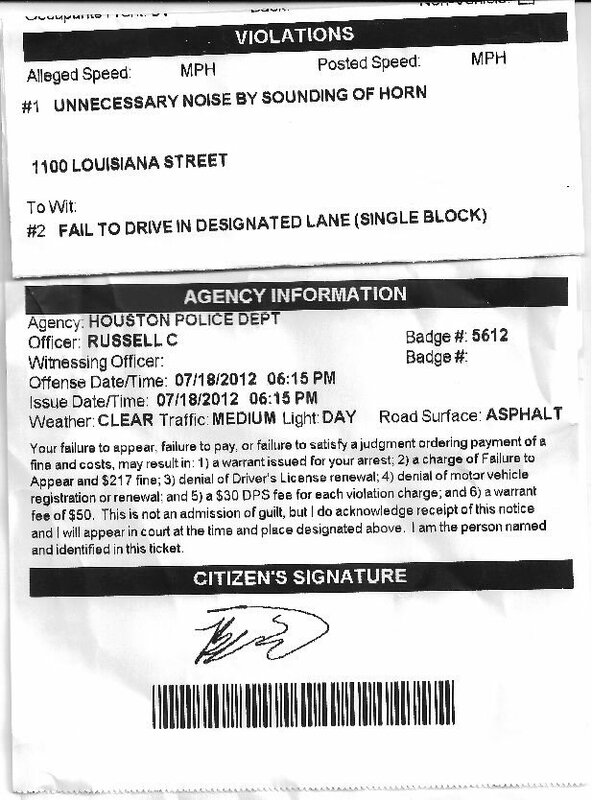 The Chronicle reports that 3 of these matters were referred to the feds by Houston Police Chief Charles McClellend. I have made posts on the blog about two of the incidents that the federal government is investigating. Unarmed teen Chad Holley was beaten in 2010 by a number of Houston police officers. Earlier in 2012, a double amputee in a wheelchair named Brian Claunch was shot and killed by Houston police. There is no way the Chief is referring multiple cases of possible police abuse and misdeeds to the federal government without the approval in one form or another of Houston Mayor Annise Parker. Mayor Parker and Chief McClelland should be commended for this course of action. In the past the Mayor has addressed racism and sexism within the Houston Fire Department. While our safety forces do many good and brave things, it is also so that some of them engage in wrong actions. It is good for Houston that Mayor Parker has been willing to confront this fact. I’m reaching a point of being tired about blogging about politics. 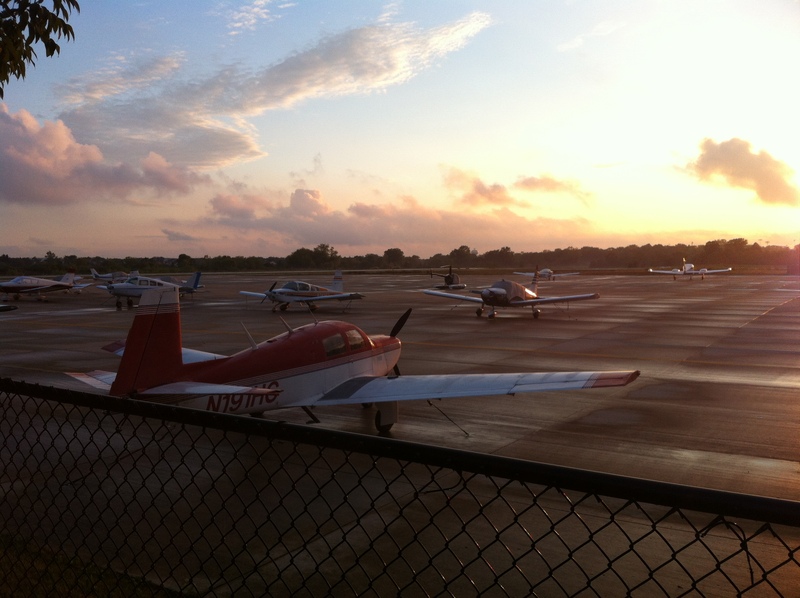 I have a picture of grounded planes here because I’ve not yet chosen a new flight plan. I’m not tired of the blog. I’m not tired of communicating with folks. I’m not tired of talking about my values in a public forum. I am not dispirited by the current Presidential race. While I regret that President Obama did not choose to prepare for the first debate in a way that respected his supporters, I’m relating a feeling I’ve had for many months now. I think the Presidential race as of today is a 50-50 proposition for both major party candidates. I will admit that I do not see the Democratic Party making major gains in Texas in 2014. 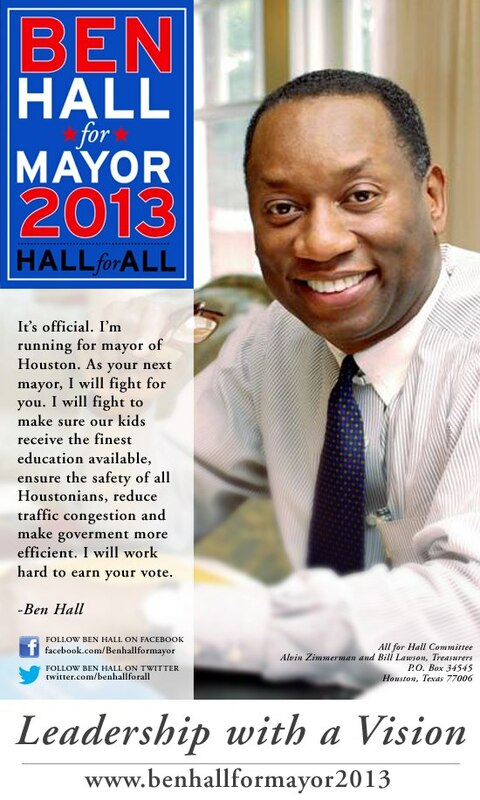 Nor do I see Houston municipal politics as offering much hopeful in the 2013 election cycle. The 2013 elections in Houston will be another low-turnout race with Democratic Mayor Annise Parker running to the right, right-wingers offering up attacks on the Mayor because Mayor Parker is gay, selfish “progressive” interest groups looking out for only themselves, and big money running the process. Here is the link to the Green Party of the United States. The Greens at least offer some hope that things can be better. I’ve been working on an art project—for lack of a better term at the moment— and I think there are many ways to communicate with folks and to convey your values and ideas. We live in a big hopeful connected world. Every person has value. Every place has value. Every moment has value. The everyday work we do merits respect. These are things I’m going to keep on saying. I’ve got some more political posts relating to Campaign 2012 to make between now and the election. I’m certain I’ll continue to make overtly political posts when I feel they’ll be helpful. I have some thinking to do about how to proceed with the blog and how to best move ahead. Thanks for reading Texas Liberal and please check back with the blog often. There is a lot more to say and to share. Actor Danny Glover was in Houston yesterday to talk about efforts by janitors in Houston to be paid a higher wage, and to talk about larger issues of economic fair play in our society. It would be great to see Houston Mayor Annise Parker and our Houston City Council Democrats taking a lead role in this issue. It is difficult to understand how these folks can work hard to criminalize many acts of sharing food with the poor, but cannot work to assist hard-working people in a fight to make just a few extra dollars. Mayor Parker and Council Democrats were silent after a Houston Police Department horse knocked down a pro-janitor protester at an otherwise peaceful march last month in Downtown Houston. 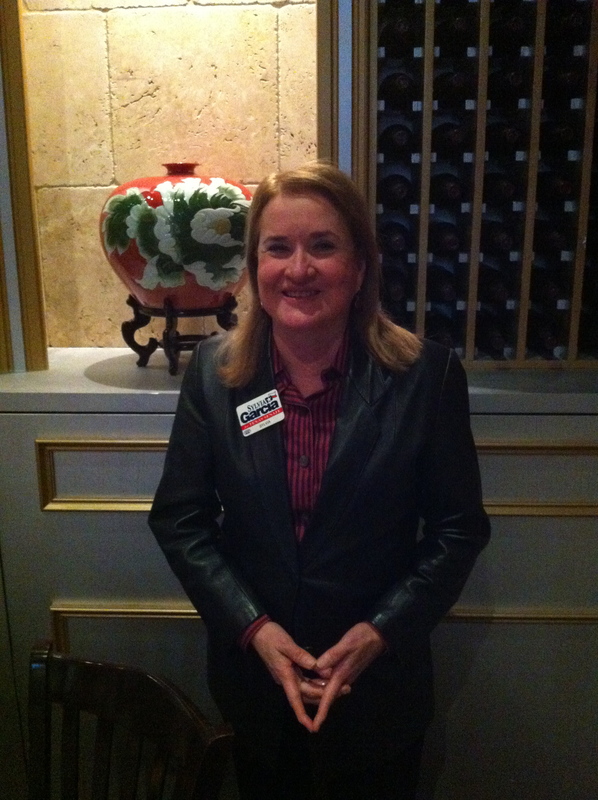 The Harris County Democratic Party and Harris County Democratic Chair Lane Lewis have been taking a role in this fight. Maybe Mr. Lewis was on the phone here asking local elected officials and civic leaders to come on down in the fight for everyday working people. 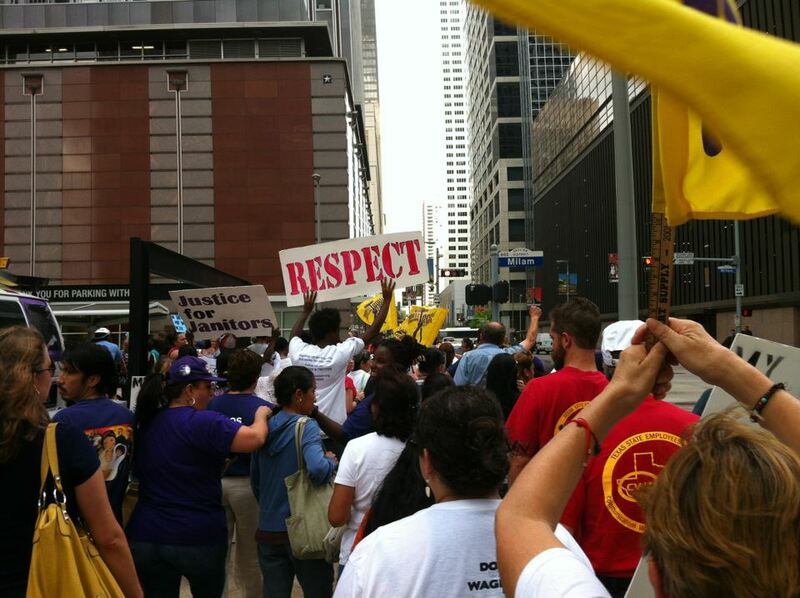 There was a peaceful protest in Houston this afternoon asking for no more than that janitors in Downtown Houston’s big office buildings be paid a more fair wage. Below is a picture I took of these peaceful protesters marching under the Flag of the United States on this Flag Day. What could be more patriotic and more American than the belief that a fair day’s work merits a fair paycheck? What could be more patriotic and American than the right to assemble and to put forth our grievances? Here is the website for these Houston janitors who are asking for a raise. 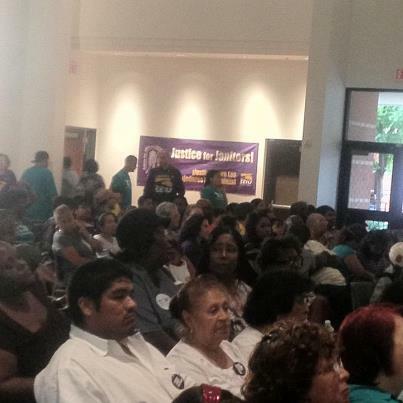 11 Houston janitors have already been fired for advocating for higher wages. The great liberal magazine The Nation has written about this issue. Here is what Houston Mayor Annise Parker- –a Democrat— recently said on her official Facebook page. Everything is wonderful. Or at least everything is wonderful so long as you are content with $ 8.35 an hour. There was one arrest at this peaceful rally. The Houston Chronicle has reported this arrest. CNBC–a business network–reports that police horses from Houston Mayor Annise Parker’s police force trampled over some Houston janitors. I counted at least 21 Houston police officers watching over this rally. Many of these officers were on horseback. There was no need for this excessive presence. This was a peaceful march. The only tension came from the excessive police presence. These were peaceful demonstrators. Police officers are working people just like anybody else. I belive that most police officers are good honest people. 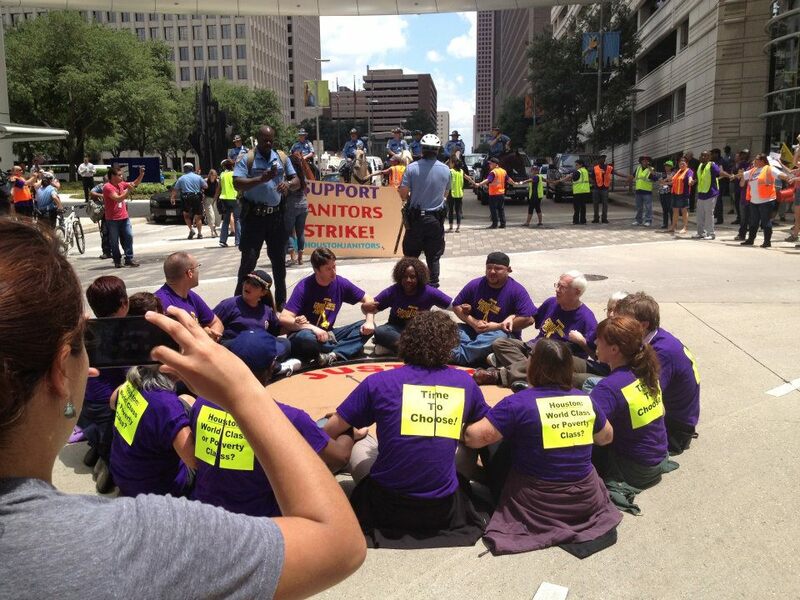 At the same time, Houston police are mistaken if they see janitors making $ 8.35 an hour as the enemy. Below is a another video of the arrest at the march that was taken by Occupy Wall Street: Houston. The arrest is at around the 2 minute point of the video. Houston City Council–with the near unanimous consent of Council Democrats as well as Mayor Parker, recently voted to criminalize many acts of sharing food with the homeless. Not a single Council Democrat was at the rally today. 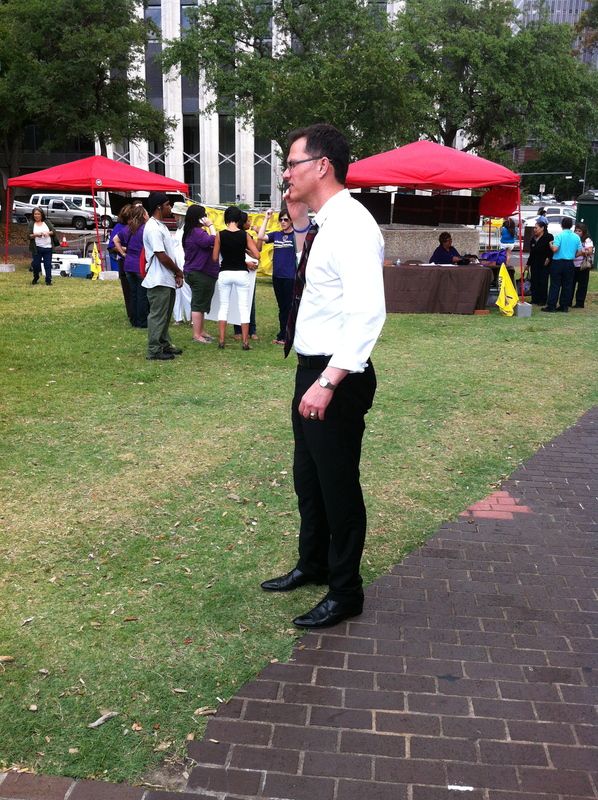 Mayor Parker was not at the rally today. What good are these Democrats if they don’t stick up for working people? The freedom of all people is connected and the work of freedom is up to each of us. The fate of all working people is connected. 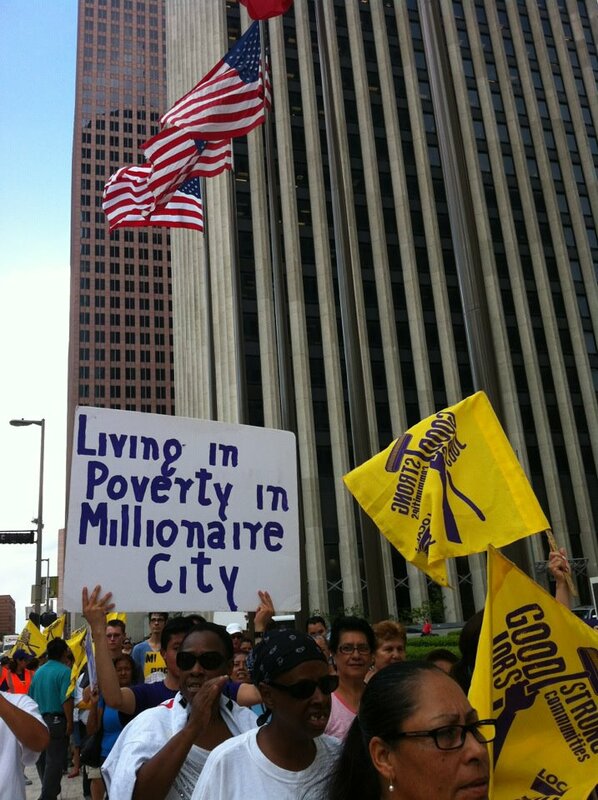 Houston janitors merit better wages and we all should consider taking up their just cause. Chad Holley Verdict By All-White Houston Jury A Source Of Concern For All Houstonians Concerned With Justice—An All-White Jury In The Most Diverse City In America? Former Houston police officer Andrew Blomberg was found innocent by an all-white jury of any criminal role for his part in the videotaped police beating of black teen Chad Holley. I was not a juror in this case and I did not hear all the evidence. I can say that it is frustrating that the jury was all-white in what is by some measures the most diverse city in America. Given our national history, our local history here in Houston and Texas, and the fact of strong divisions of all kinds in America, it is a given that an innocent verdict in the case from an all-white jury would provoke a strong reaction. Given the present day role of our so-called justice system as a new Jim Crow that incarcerates black men at an alarming rate, it is a given that an innocent verdict in this case from an all-white jury would provoke a strong reaction. The Houston Chronicle reports that Houston Mayor Annise Parker and Republican Harris County District Attorney Pat Lykos disagree with the verdict. Some local black activists and local black ministers have reacted angrily to the verdict. Just imagine if these leaders spoke up consistently on a broad range of issues of justice that impact all people and not just one group of people in Houston. If they did, they would be listened to with greater respect when issues seen in a conventional and narrow sense as mostly impacting black folks were before the public. At the same time, where are the voices of people of all kinds in voicing concerns on this matter? 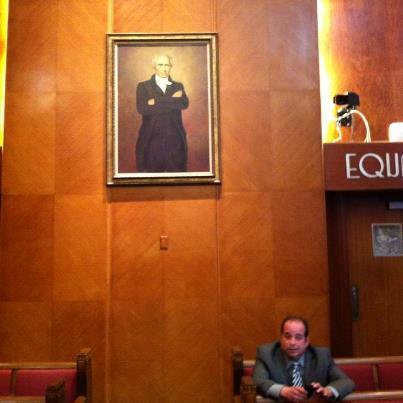 If a broader cross-section of Houston white and Latino progressives and liberals would speak up with concerns about the verdict of an all-white jury in this trial, maybe this would help lay the groundwork for a more energetic and hopeful progressive coalition in our city. Here is a link to the video of the Chad Holley beating. Three former Houston Police officers are awaiting trial for their roles in the Chad Holley beating. A few hours back I went to the blogger lunch that is hosted each month by Charles Kuffner. Mr. Kuffner writes the top Houston and Texas political blog Off The Kuff. 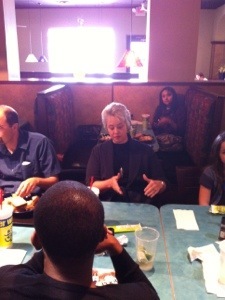 The guest at the lunch this month was Houston Mayor Annise Parker. Below you see a picture that I took of the Mayor at this lunch. The Mayor has her hand raised as she takes a pledge to read Texas Liberal each day. No–I’m making that up. I’m not sure why her hand was raised. She was making a point about something or other. The Mayor was quite cordial and took questions for just over an hour. 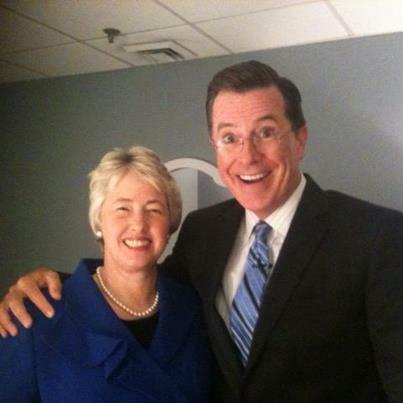 In the days ahead I’m going to offer some thoughts about Mayor Parker, and issues related to moving forward in Houston. My thoughts will be less about what the Mayor said at the lunch today, and more about the need for an effective and constructive progressive and liberal opposition in Houston. Not an opposition that simply exists to oppose Mayor Parker when she veers more to the right than need be. But rather a more long-term, consistent and hopeful force that helps change the political climate here in Houston, so that we don’t see again Council Democrats passing a law that criminalizes many acts of sharing food with the homeless. An opposition can “govern” in the sense of offering hopeful alternatives to what we get from people in “official” positions of power. An oppostion can “govern” in a fashion if it develops the capacity for disciplined and effective advocacy and leadership. This is what I want to talk about the days ahead. After the lunch, I took a long walk along Allen Parkway here in the city. I’d say I walked for about five miles. This long walk gave me plenty of time to think about stuff. 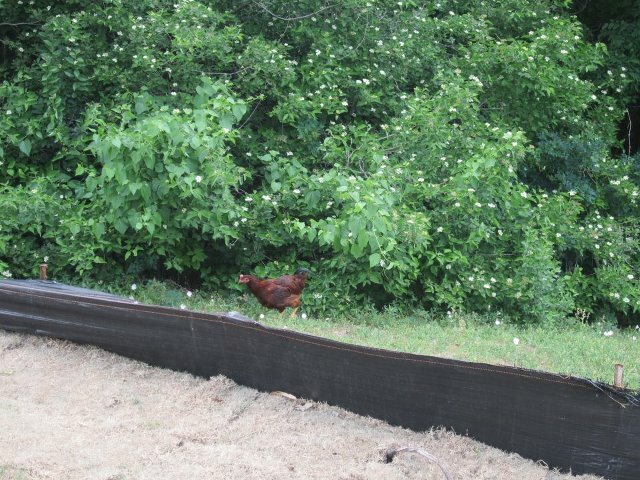 While engaged in this thinking, I came across a chicken. I do not believe there was any connection between Mayor Parker and the chicken. 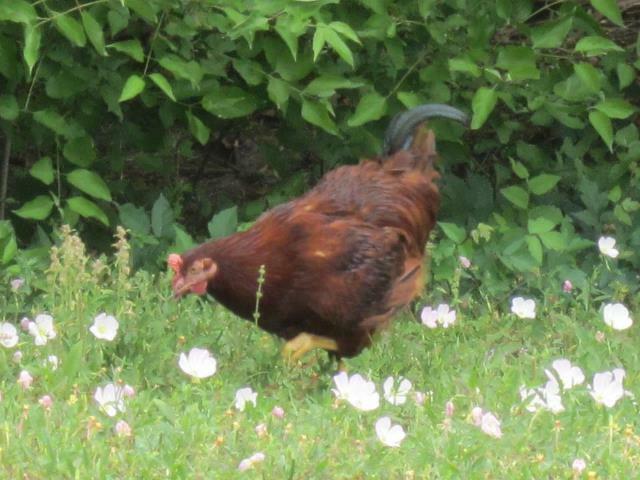 My Uncle Tom in Providence, R.I. saw these chicken pictures on Facebook. He insists that this bird is a Rhode Island Red. Based on this Wikipedia entry, I think my uncle is correct. As a former resident of Rhode Island, I’m very glad to have seen such a bird. Thanks to both Mayor Parker and to the chicken for a good and productive day. City Of Houston Sobering Center To Offer Options For Those Down On Their Luck—Why Doesn’t Mayor Parker Include This In The Ongoing Debate On How We Treat Those Down-And-Out In Houston? I remain strongly opposed to the mean-spirited Houston anti-food sharing ordinance, and will continue to criticize Mayor Parker when she merits criticism. 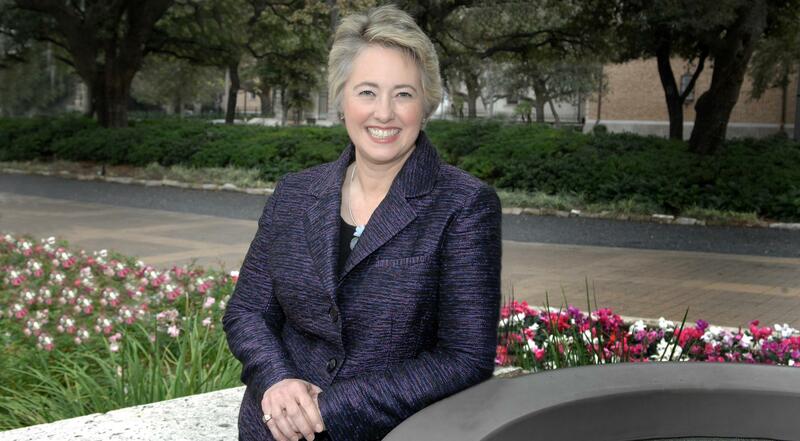 It turns out to be fairly often that I feel Mayor Parker merits criticism. On the other hand, the City of Houston Sobering Center announced a few weeks ago will keep people out of jail, and will help provide options to those most down on their luck. It is also true that some of the folks on the right opposing the food-sharing law are a pack of hyenas that would not leave Annise Parker alone if she cured cancer, and who are in no respect champions of the poor. It’s a failure of the Mayor’s political team that a larger narrative has not been put out there that includes this sobering center, as the Mayor’s support among Democrats and progressives takes a justified hit with the anti-sharing ordinance. Here is a form to volunteer to help repeal that anti-food sharing ordinance. Houston City Council, led by Mayor Annise Parker and Councilman James Rodriguez, have passed an ordinace that will criminalize many instances of sharing food with the homeless. Here are some details of this law from Mayor Parker’s office. Mayor Parker and Mr. Rodriguez are blind to the fact that Sojourner Truth understood many years ago—It is the shadow that sells the substance. This new law is a mean-spirited law that is meant to harass the homeless. It is the third restriction on the homeless in nine months as we offer public subsidy to soccer stadiums and so-called arthouse movie theaters. There is a Facebook group that is opposing this new law. They are circulating a petition to oppose this new law. Go to the Facebook page to learn more details. Some of the folks in the coalition to defeat the new law are very good people who are concerned with the fate of all people. Others are conservatives who just want to move Houston to the right, and see this as a chance to link the brutality of modern conservatism to an illusion of compassion for those most in need. I support repeal of this law and will post on this subject a number of times in the days ahead. At the same time, I will keep some distance from the organized opposition to this law. Collective action is essential, yet it is individual conscience that must guide our acts. The Keep Houston Sharing Free website has come up with talking points to discuss this cruel ordinance in the days ahead. These points are useful if you decide to circulate the petition, or if you just want to discuss the new law with your fellow citizens of Houston. 1) The new ordinance will regulate a natural expression of human compassion, inhibit groups sharing food with the poor, and cause suffering. Any group or individual who drives around looking for hungry people in need of food will be immediately criminalized since they wouldn’t have prior written permission for the locations where they find people. A significant portion of Houston homeless rely on these forms of spontaneous feeding. This law will cause homeless people to suffer and become sick. 2) In City Council chambers, the few homeless service providers who supported the law were those with city contracts, every other homeless and poor service provider opposed it. 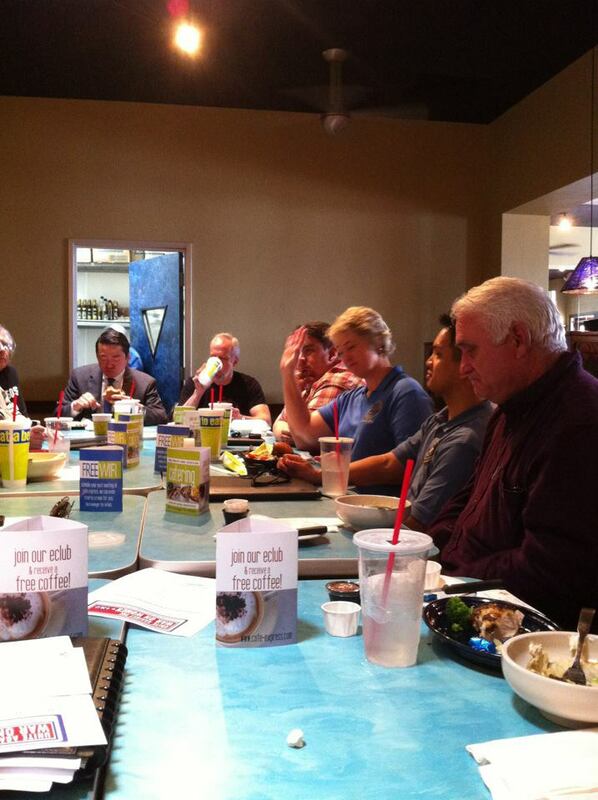 At a faith-based food sharers study group conducted by Coalition for the Homeless, not one of the many diverse religious group representatives favored the mandatory and punitive aspects of this law. These compassionate people know best: this type of law will cause poor to suffer. 3) Requiring permission for groups to serve has precedent. In San Francisco in 1988, the permit requirement was used to criminalize and arrest hundreds of food sharing volunteers. Asking for permission is never easy, free, quick, or fair. These permit requirements violate 1st Amendment freedoms of assembly, speech, and religion. Since the law only applies to those sharing food with the homeless, and not those at a tailgating party, the law violates the “equal protection under the law” clause of the 14th Amendment. 4) The law was written hastily and is incomplete, declaring that “there exists a public emergency” without explaining what the emergency is. The law does not include a fee schedule or any of the criteria or processes for obtaining permission to serve. It seems it was written vaguely intentionally to require expansion later, when public attention has waned. 5) The law doesn’t achieve any clear policy objectives. The extra expenses that will be incurred are not necessary and have not been budgeted. The law creates additional work and bureaucracy for various city agencies and homeless food providers without any clearly identified benefits. The law punishes, but does not reward. There were no studies or data presented to justify a new law. 6) When interviewed, over 90% of homeless downtown indicated that without volunteer groups able to help them in the streets, they would turn to crime, begging for money, or less healthy options. 7) The permission process could be used to re-introduce all of the most hated criteria that were taken out of the earlier draft. 8) The police would be given the new job of surveillance and enforcement against good Samaritans. The amount of the fines are said to be $500, which is much more than the entire monthly income of many who help the homeless. 9) There are over 60 groups speaking out against this law. From the conservative Houston Area Pastor’s Council to the Catholic Workers, from Occupy to the Tea Party, evangelical protestants to civil rights organizations, from the Harris County Republican Party to the Green Party, from the Nation of Islam to the Hare Krishnas, the diversity of these groups may well be unprecedented. 10) We the people have a right to share food with the needy and no one has the right to make us ask for permission each time. Volunteers help feed the homeless without making financial demands on the city, and as such should be held up as examples, not criminalized. 11) Spontaneous and un-coordinated distribution of food to the needy is a proud Houston tradition and groups have done so for years without problems. 12) Mayor Parker did not offer any studies to document instances of food poisoning, significant food wastage, or the projected impact of these new regulations on homeless populations. 13) The management districts in and near downtown are funded with tax dollars to implement service plans (posted on their websites) that embrace responsibilities that warrant placement of trash receptacles, public toilets and litter removal programs to beautify and rebrand their geographic areas, and already do so to an extent. 14) No laws can eliminate the annoyances the mayor’s ordinance is addressing, and trying to do so will waste police time in a futile quest.